The Wobbel was developed by Hannelore Blaauw and Wouter Haine and is produced using only natural materials. Rianne Roodbeen contacted Hannelore at the beginning of 2017 because she saw great possibilities in combining yoga and the Wobbel. With the enthusiasm of Hannelore, Rianne started developing Wobbelyoga and taught the first lessons in Amsterdam in April 2017. The Wobbel is a beautiful balance board which enhances body awareness in a playful way and stimulates creativity, balance and strength. The Wobbel is not only good for young yogi’s, but also for the environment. The board is completely manufactured with natural materials and made out of sustainable European oak. Additionally it contains the organic products EKO wool felt and sustainable cork. The Wobbel is CE certified up to 200 kilograms, so both kids and adults can enjoy it! Wobbelyoga combines the best of yoga with all the possibilities the Wobbel has to offer. 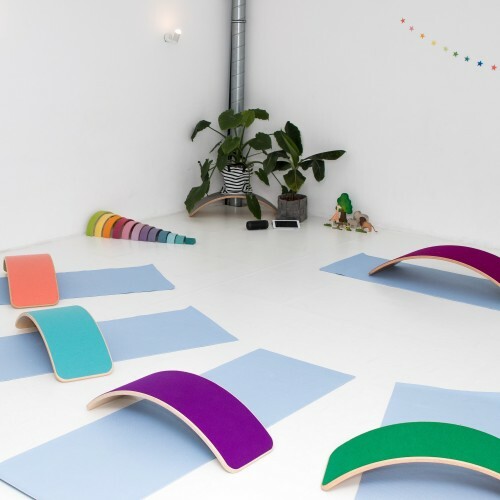 The Wobbel innovates the yoga classes and enables kids to work on their strength and balance in a fun and playful way. The rhythmic movements on the Wobbel calm the body and mind. During the classes the kids will enhance their body awareness and confidence. Exertion and relaxation alternate constantly and at the end of the class they step off of their Wobbel full of pride and with a big smile on their face.